Today I am proud to announce that I have joined the Big Switch team as an Open Networking/SDN Evangelist. Big Switch is a leader in the SDN space and their recent releases of Big Cloud Fabric 3.0 and Big Monitoring Fabric (read Rob Coote’s impressions from NFD10) are significant accomplishments. I believe the free flow of information and ideas is key to the development of the networking community. Big Switch’s focus on the Open Network Linux, Indigo and Floodlight open source projects fit well with my vision. Tracing back to my days of BBSing, I have focused on being open and have been willing to share information and ideas. I published my first newsletter, DSiOW (DOS Sysops in an OS/2 World) back in 1994, when I ran virtualized DOS based BBSs in OS/2 DOS emulators. The goal of my newsletter was simple, help others to run better systems by sharing information on how I and others setup their OS/2 systems. Moving to more recent activity, I helped found the Network Device Education Foundation (NetDEF) and made Router Analysis and SDN Testing projects under NetDEF, continuing my goal of providing free, open data about networking devices and software. In July, as part of NetDEF, I gave a standing room only talk at the OpenDaylight Summit, wrote blog posts on and posted some videos on SDN migration. So the big question is, what will I focus on? First and foremost: working with the community surrounding Open Network Linux (ONL), a key part of the Open Networking ecosystem. Open Network Linux is a free, open source Network Operating System (NOS) that runs on Open Networking hardware from both branded vendors (e.g. Dell), “whitebox” switches from Accton, Quanta and many other devices. Secondly, I will be helping Big Switch to extend its thought leadership in the SDN space by working with the open networking community and industry to refine and focus the way that Big Switch interacts and supports the open networking community. Third, I will be working with customers explaining the value Big Cloud Fabric and Big Monitoring Fabric, products that are built on top of Big Switch open source initiatives. Outside of Big Switch, I will continue to serve as President of the Board of NetDEF and on the ONF Software Leadership Council among other projects. I am excited to join the fantastic team at Big Switch and help move Open Networking forward. 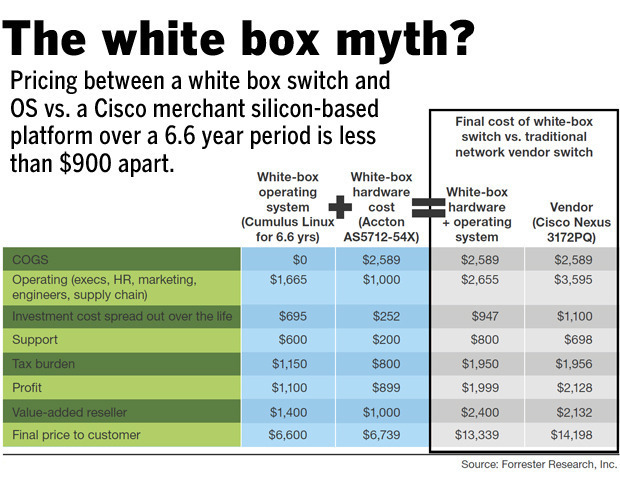 As Open Networking has grown, we see discussions about the cost of “white box” vs vendor switches and questions if the difference in cost is real. Vendor boxes such as the Juniper QFX3500 QFX5100, Cisco Nexus 3172, Brocade ICX 7750 are compared against ODM boxes such as the Edge-Core 5712-54x and Quanta T3048-LY8. The numbers provided in many of the reports are cursory and not exposing some of the issues IT decision makers have to address. Juniper QFX3500 QFX5100 (it has been pointed out that the 3500 is a Trident+ and I should really compare the 5100 which is a TridentII). When you buy a license for Cumulus Networks Cumulus Linux, You are also provided with a network operating system with full L3 routing features. You are also provided with 24×7 support as part of the license. With Juniper’s QFX3500 QFX5100 you get L3 routing features, and with the Cisco Nexus and Brocade’s ICX 7750, you get a base L2 OS with limited L3 features, None of these products include support. Pica8 like Cisco, sells their OS and in different flavors, an L2 and a full L3 version. Pica8 does not bundle support with their software license. All of the vendors offer support running anywhere from $800-$1600 a year and offering either software only or software and hardware support. A reasonable comparison between a Cisco Nexus 3172 at $14,000 with no support and no software would be a Edge-Core AS5712-54x at $6750 running Pica8 L2 software for $2199 and a total of $8949 making it 36% less. A reasonable comparison between a Cisco Nexus 3172 with L3 software ($19,000) a Juniper QFX5100 ($21,000) or a Brocade ICX 7750 with L3 Software ($20,000) with no support would be Edge-Core AS5712-54x at $6750 running Pica8 L3 software for $3199 and a total of $9949. Or you can buy a bundled version of the P5101 from Netgate for $9940 a ~50% difference. A reasonable comparison between a Cisco Nexus 3172 with 5 years 8x5xNBD support and L3 software (total cost $24,000), a Juniper QFX5100 with 8x5xNBD support (total cost $27,500) or a Brocade ICX 7750 with L3 and 8x5xNBD support (total cost ($23,420) would be a Pica8 P5101 with a Pica8 L3 license and support for $14,410 or Edge-Core AS5712-54x at $6750 running Cumulus Linux for $4,499 for a total of $11,249 a minimum of 50% less. Changing out the Juniper QFX3500 for the QFX5100 added about $2500 to the price. I spent most of my drive back from Sacramento this afternoon recording thoughts about Open Networking, ONIE, Cisco, HP, Juniper, Brocade, Testing and Support. It is going to take some time to go through and get all of the relevant data out, so I decided to put some of my talking points here. When any networking vendor and especially a large one like Cisco announces support for Open Networking, such as ONIE on the Nexus 9000 (even if it is just “roadmap”), it is a huge gain for the community. There are multiple values to having ONIE available on hardware, the ability to load another NOS is just one of them. One that gets overlooked is that ONIE allows customers to utilize the same deployment/testing bootstrap configuration across multiple systems. While we would love to see Cisco support other NOS on their boxes, just supporting ONIE, even on the roadmap, is a huge step in the industry. 2.) The HP/Cumulus announcement is important not only to HP/Cumulus, it’s also valuable to the Open Networking industry in general and will lead to better Open Networking products. While the announcement from HP can be simplified down to “HP will sell Accton switches running Cumulus Linux”, the benefits to the community are much broader. The real story is between the lines: HP will _support_ Open Networking. Having a vendor the size of HP provide support for an Open Networking platform is highly valuable to the Community. In order to support the products, HP will be running Accton switches in their labs, doing PoCs and putting resource into testing, documentation and other important work. While we know the hardware is good (end users via reselling have been running Accton, Quanta and other ODM switches for a long time), customers are still getting used to dealing with ODM equipment. Having HP stand behind Accton while running Cumulus Linux is much bigger than the two companies. 3.) Junipers involvement in the Open Compute Networking Project is important. By providing an open switch design and a version of JunOS that runs on Open Networking Switches, Juniper has put a solid name behind Open Networking. Running JunOS on Linux (via KVM) is going in a direction that I believe the industry needs to move in. The move supports the concept that there can be a separation between the OS and the Network Applications. I believe that differentiation in Open Networking will come from the Network Applications, not the hardware or base operating system. 4.) Coming back around to the announcement of ONIE on Nexus 9k. Both the JunOS on Linux and Nexus NX-OS systems run on top of Wind River Yocto Linux. Two different top vendors running on the same base OS provides another proof point to how open Open Networking devices could be. This is the first in a set of blog posts in which I hope to cover the idea of Open and it’s value to the dominant players in different networking spaces. There has been a lot of discussion on Twitter, Blogs and other social sites (LinkedIn, etc) about the coming Software Defined apocalypse. Whether the discussion is about software defined networks, data centers, or enablers (such as ODM switches), there is a general picture that the Software Defined products / enablers are trying to destroy dominant player x in the space. I view things differently: now is the time for the dominant players to focus more on extending their strategy to include Open in order to defend their market share. 1.) Most if it not all network device vendors sell one or more rebranded ODM device. An example ODM would be Advantech, which has been around for over 30 years and builds ODM appliances sold by many networking companies. 2.) Google was very upfront with networking vendors about their networking needs, yet Google’s needs were not fulfilled, therefore Google and later Facebook looked for ways to provide for their own needs. 1.) The day an enterprise can buy a Cisco router/switch and put a different NOS on it is the day Cisco gets it. 2.) 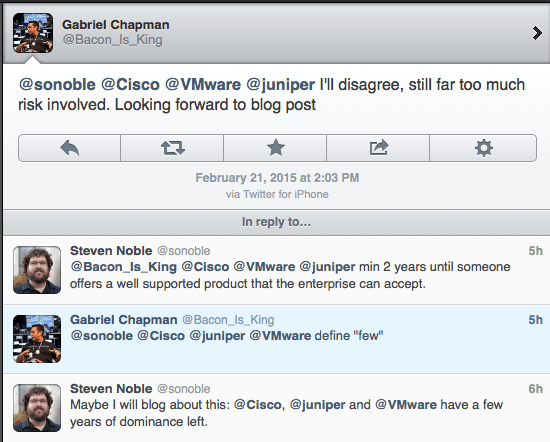 Cisco, Juniper and VMWare have a few years of dominance left. 3.) By a few I mean a minimum of two years before someone offers a competing product that is well supported and the enterprises can accept. My goal with the tweets was not to proclaim the death of Cisco/Juniper/VMWare, but to bring attention to the fact that over time Open solutions will catch up and that it is up to the dominant companies to maintain their dominance. I am going to exclude VMWare from this post as this post focuses on networking hardware and VMWare/Virtualization requires its own post. The value of Open Networking and Openness in general is not just cost, it’s also features, functionality and most of all flexibility. The Open Networking market is being hit with “me too, but cheaper!” products that can take the place of Cisco/Juniper/Huawei/etc devices. These products also offer advanced features, but this is not a compelling driver for enterprises at this time as support (i.e. 24x7x365 phone/email/patches) is limited. Enterprises are looking for flexible devices that provide stable, supported feature sets and allow for future functionality. Companies like Cisco and Juniper have very good support systems, but Open Networking will catch up in the next few years. My view is that in order for open networking to take hold in the enterprise the hardware and software needs to be out and tested for at least a year if not two. While software and hardware exists, and the hardware has been tested (remember ODMs have been around for a while), the software is still young and most of the testing has been done by bespoke operators with specific needs. Enterprises buy Cisco and Juniper because they trust the brands and the Network Operating Systems are proven. I think it’s important to note that over the last two decades, Cisco has done a lot of work to bring alternate operating systems onto their platforms, especially the 6500 (with AYR). It’s also important to note that Juniper’s JunOS was and still is based on FreeBSD. Cisco has recently announced ONIE on the Nexus 9000, but does not officially support other NOSes. Juniper has also embraced Open Networking with the introduction of the OCX1100 and has worked to decouple their hardware and software. What Can Cisco, Juniper and Others do? In my mind, it is clear that Open Networking will dominate the enterprise space in the next 2-5 years. This means that Cisco and Juniper need to develop open networking strategies focusing on the value of their software running on what will eventually be commodity switches. Having a Cisco or Juniper NOS on the Facebook Wedge would provide enterprises with the support they need while allowing the enterprises to feel secure that they have the ability to choose best of breed for their situation. Cisco and Juniper (and others) can also focus on providing support for other network operating systems on their current hardware, by providing a HAL, allowing their customers to deploy what they need. As both Cisco and Juniper have some rebranded ODM products, a HAL for those would be a straightforward project. The value of allowing other NOS on Cisco and Juniper’s current hardware is great and the downside is minor, especially as Cisco and Juniper focus on opening and extending their NOSes. Innovation is core to the Internet and competition is good for consumers. While this is true, Facebook is innovating, but not competing, even if Cisco claims they are. Since the beginning of networking, there have been hacks. No device or feature fits every customer. Whether these hacks were in the form of scripts, hardware modifications, software features or complete systems, they were born out of need. Facebook has a need. I have been in the industry long enough to have seen companies like Blizzard, Akamai, Hotmail and many others conquer scale issues. The initial solutions were ugly (motherboards screwed directly to metal shelves..) but they were brought on by a need that was not being fulfilled by the computer industry. We are in the same place today, but in the networking space. Companies like Google, Facebook and Amazon are hampered by the products that are being offered by the big players, Cisco, Juniper, etc. It’s not just price, it’s also features, functionality and support. So with that background, it is easy to see why Facebook, Google and smaller companies like NGI “SDN for Real” would build (or design) their own routing/switching hardware. These companies already did it for their server infrastructure, and a switch, at it’s core, is just a specialized computer. It wasn’t long ago that many of the main Internet routers were repurposed mini computers with multiple interface cards, such as the ANS RISC System/6000-based T-3 routers. Another driver helping Google, Facebook and others build switches is the availability of Open Source Networking Software. While routing stacks such as gated, zebra, etc have existed for a long time (again, back to the repurposed mini computers) the availability of “whitebox” or open switching hardware and features like DPDK from Intel are a more recent occurrence. This open hardware allows people to utilize Open Source Networking Software such as Quagga. From the support side, one of the benefits of Open Source Software is the ability for companies to modify, patch and tailor the software to their needs. This is very different from the previous support model where companies would have to go to their vendor, ask for a fix/feature and wait. Today companies can change it themselves, hire someone to change it or wait for the feature/fix to come in a later release. My musical activity has increased recently with the release of a few songs via DistroKid. As many of you know, I am the Chief Technical Officer of Sideband Networks, a still-in-stealth startup using real-time analytics to assist in the networking space. I was previously VP of Technology for XDN, who re-invented the content delivery space and was acquired by Fortinet. With the six-month anniversary of my joining with my fellow ex-exodus friend, Zane Taylor coming up around the corner, I thought I would share some of what I have learned so far. The Chief part of your title means you must lead by example: You are the technical center of the company. The decisions you make, the work that you do, must push the company in the direction of success. Pivoting is natural, do it intelligently: In the early stages of company building, there will be times when you must make hard decisions. You might need to change hardware vendors, or stick with one may not be optimal in the long term. There may be decisions about software strategy where time and money are involved. The best way to pivot, is to do it carefully and if at all possible, in a minor way. Micro-pivots are easy to deal with and are strategic to tightening up the focus of the company. When you are doing things that have not been achieved before, celebrate the small victories: The company looks to the CTO to validate the direction and progress of the product(s). Know what your customers are looking for and when milestones are hit, point them out. Above all, don’t be afraid to get your hands dirty: Sometimes you have to cable up some new equipment, deliver boxes to customers or clean off a desk for a new employee. Embrace these tasks and do what you want your other employees to do. Being a CTO is not just about Evangelizing products and solutions. It’s about being a thought leader and focusing on the future, how to get there and the future includes NOW.